Tattoos were traditionally used to mark a rite of passage or as a form of identification but are now more a personal expression. The symbolism of tattoos can represent many things such as inner strength and moving forward or creativity and passion. For some cultures, a tattoo especially, is an artistic badge of pride that also gives its wearer a sense of identity. 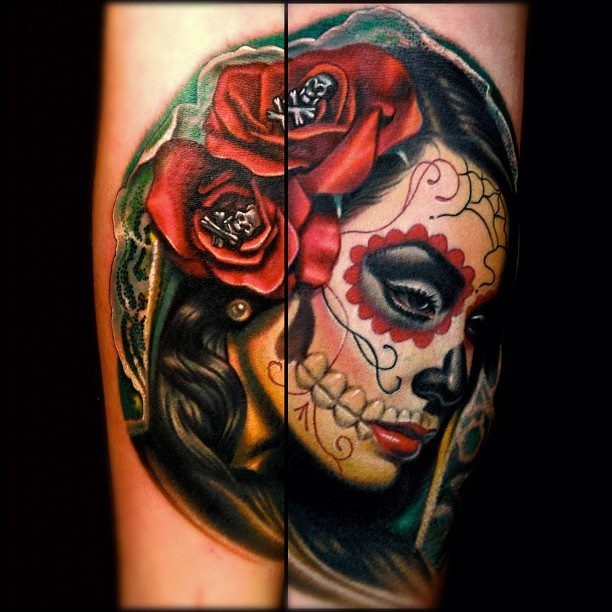 We’ve gathered 10 beautiful tattoos from around the world for your viewing pleasure. Who knows, maybe you’ll even consider getting a little ink on your skin after this! 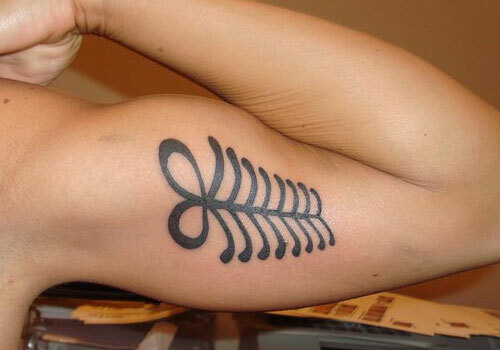 Egyptian tattoos are popular because of their ornate detail and symbolism. 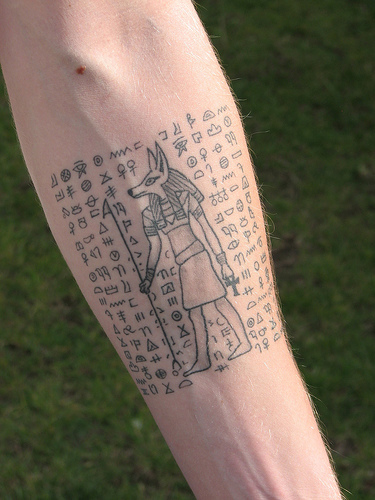 The tattoos may incorporate Egyptian gods, goddesses, pyramids, mummies, the sphinx, Anubis and much more. Hieroglyphs are especially popular – they could be a simple line drawing or as detailed as one wishes them to be – and can be used to create gorgeous and meaningful tattoo designs. 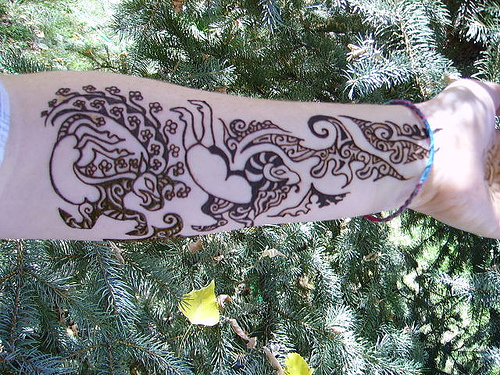 Henna tattoos are non-permanent tattoos that last for a couple of weeks at most. The paste is an organic dye made from the Henna plant that is then squeezed onto the hand and left to dry for an hour. 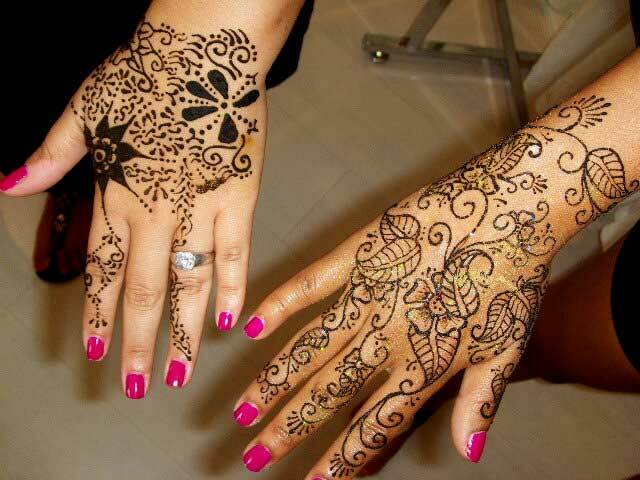 Henna designs are an ancient form of body adornment and hold many special meanings. Presently, the tattooing is commonly found in ceremonial practices such as marriages and births as a form of expression for luck and happiness. The designs consist of various shapes and symbols, though most women prefer the flower designs for a more feminine and delicate look. However, most Henna artists suggest for the tattooing to be done freehand and intuitively to allow for a spiritual connection between them and the wearer. The adrinkra symbols from Ghana are visual representations of popular proverbs and maxims, historical events, certain attitudes or behaviours of depicted figures, or concepts related to abstract shapes. 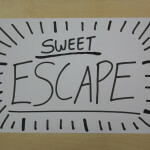 Though they are used on fabric, walls and poetry, they can also be used as tattoos. These symbols are each used to communicate a different message of a part of the wearer’s life or those around them. The Taino once had no written alphabet but instead, had a language called “Arawakan”, which was made up of petroglyphs carved on rocks. 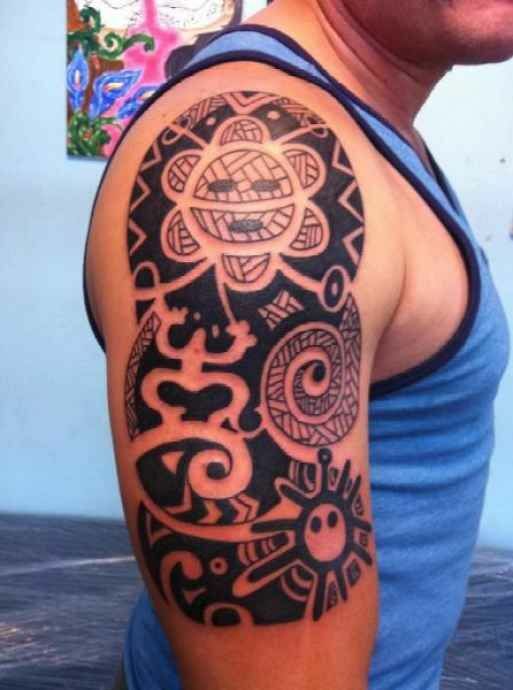 The men had these symbols tattooed for spiritual purposes, but because of the bold imagery, this tribal art has become increasingly popular yet again. 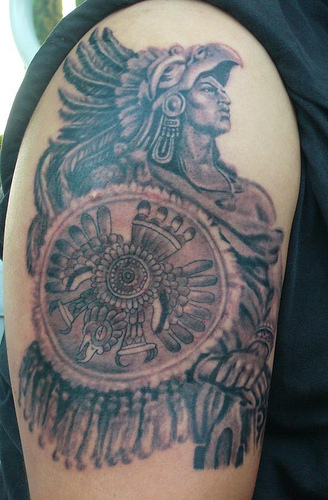 Aztec tattoos get their meanings from the Aztec mythology. They were always done in honor of an Aztec God, and done only during rituals. These tattoos were once used to differentiate people of different tribes, and their placement depended on which God they wanted to appease. 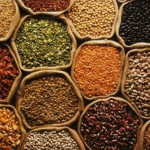 Popular choices were the wrist, chest and stomach as they were said to be the seats of power. 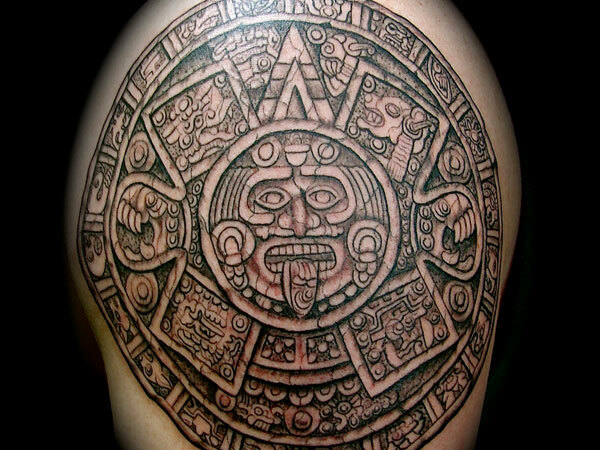 The Mayans believed that tattooing their body with depictions of their Gods and the world around them would bring them prosperity and inner peace. The Day of the Dead is a Mexican holiday on the 1st and 2nd of November that celebrates family and friends ones who have passed away. 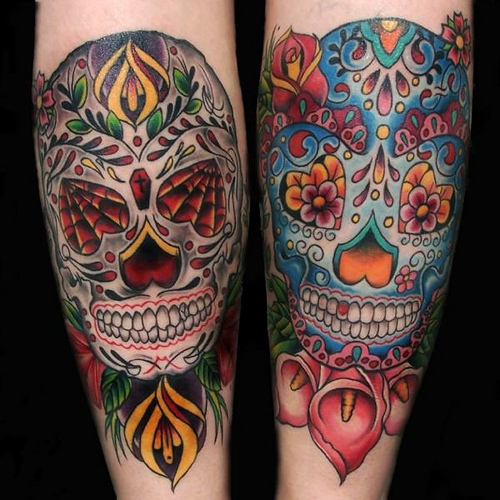 As such, Day of the Dead tattoos often portray loved ones as skeletons in bright clothing, holding instruments and in a festive mood. 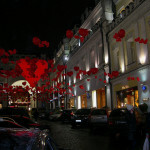 This is to represent how even though it is accepted that the loved ones have passed on, they are still alive in spirit. 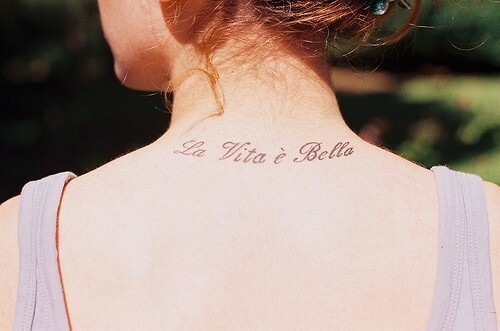 As with other lettering tattoos, Latin lettering tattoos are to be read. Sometimes the words are cryptic and only meant for the wearer to understand, while sometimes they are quotations from popular literary works. 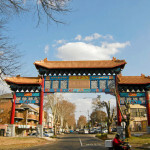 The lettering style (also known as “typeface”) may be simple or intricate. As Latin is not often used today – and as with every other tattoo done in a foreign language – do quadruple check your translations with several sources before getting your letterings done. Scythians once wore tattoos as a sign on nobility. It was uncovered that a Scythian chieftain had depictions of wild animals tattooed on his body, such as a stag, a ram, griffins and a fish. A Scythian-style tattoo is rich in design techniques, forms and complex patterns. The animals drawn include a mixture of traditional decorations from various nationalities. 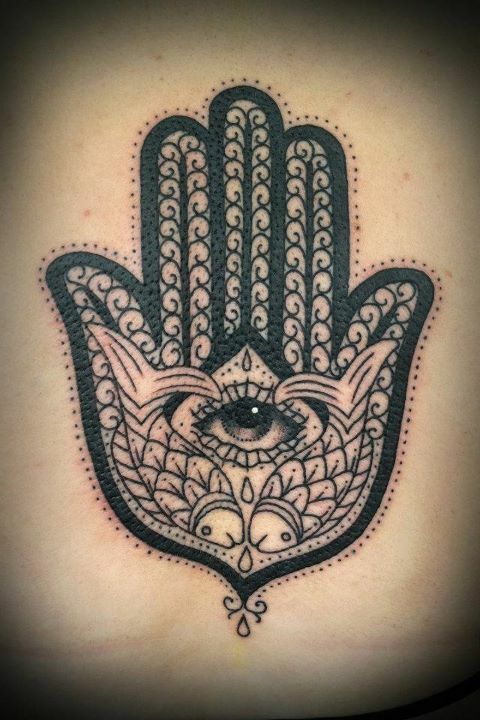 Hamsa (“five” in Hebrew) means five fingers from your hand, or the five senses people have. In the Middle East, hamsa hands are popular as people believe they bring about protection, courage, confidence and calmness. 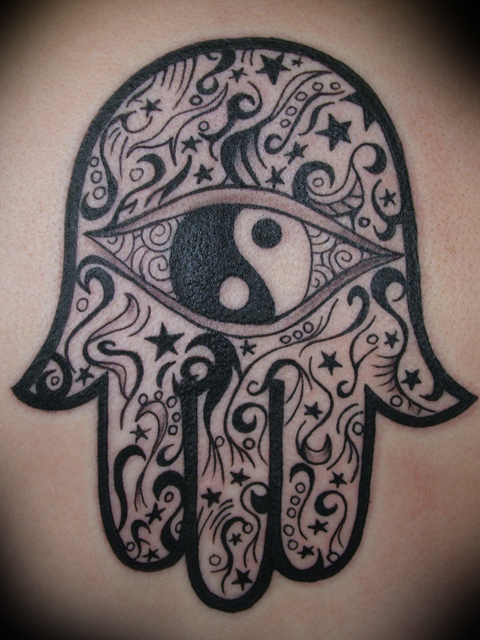 In Islamic cultures, hamsa hands are also referred to as “hand of Fatima”. While the eye in the center of the hand is believed to fight bad luck, the upward hand represents protection and blessing, and the downward hand is symbolic of how good things will come, and to warn others to keep away. Although some people do still associate tattoos with gangs and violence, they hold much more symbolism than that. Ultimately, it is up to you to give your own meaning to the artwork engraved on your skin. As long as you like it, that’s all that matters. Which of these tattoos do you like most? Let us know in the comments!